Passengers on the route 903 Smartbus are still being forced to stand on slow, infrequent and overcrowded buses serving the busy Chadstone Shopping Centre. Despite previous concerns over crowded buses expressed by the Public Transport Users Association (PTUA), the State Government has made no commitment towards fixing the problem. 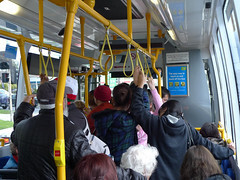 The PTUA has found no shortage of crowded buses as evidenced by further photographs. It is calling for an immediate upgrade of weekend services to run every 15 minutes, followed by an upgrade to run every 10 minutes, seven days-a-week within the next two years. “It’s well and truly clear now that many of these buses are crowded and a boost to weekend services is warranted,” said Jeremy Lunn, the PTUA’s Outer East Convenor. “There’s really no excuse now, as our photos show, passengers deserve a better service such as buses every 15 minutes on weekends commencing immediately”. However, Mr Lunn has warned that the PTUA will not accept a ‘band aid’ solution to the crowding problems seen around Chadstone. The PTUA’s calls for improved bus priority have also fallen on deaf ears. A letter from Public Transport Minister Martin Pakula received by Mr Lunn states that “VicRoads have not identified bus improvement works at the intersection of Warrigal Road and Princes Highway (East) as a priority”.